A Windows VPS has varied benefits which people are taking advantage of all around the world. It is very affordable and acts just like your dedicated server. But in order to take all the advantages of a Windows Virtual Server you need a perfect, cheap and a reliable host so that you can make the most of your money. You need somebody like Web Host BD. Windows VPS Hosting has gained popularity recently because of the advantages it offers. Here you get all the features of a Dedicated Server Hosting and still pay the fraction of its price. This is not enough; a Windows Virtual Server has lots more to offer. Customizable plans and ease of use, all backed up by an efficient support system is all about Windows VPS or we can say Web Host BD. If you sign up with Web Host Bd, then creating your very own VPS account is very easy. And not only that, it gives you an access to a wide range of features too. You will get your own dedicated IP address, an expert tech support which is available 24/7, 365 days a year, free power panel, unlimited DNS Hosting, 99.999% uptime with a 30 day money back guarantee. This is not all; you will also get free firewall protection for your server. Our VPS Servers or Virtual Servers are very easy to maintain. All this gives you the best value for your money. The most important advantage of a Windows VPS is that you do not have to spend your money on buying high end hardware. Nor do you have to employ an expert to manage your server for you unlike a Dedicated Server. At Web Host Bd we will do it all for you at no extra cost. All you have to do is just pay for your VPS and you are all set. At Web Host Bd, you control your VPS and we manage it for you. This feature makes your Windows Virtual Server very much affordable for you and also you get the best support. 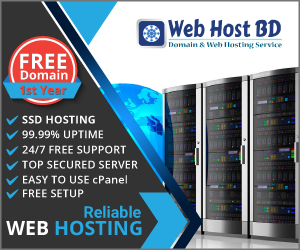 Web Host Bd is in hosting industry since the year 2012 and has accumulated a lot of expertise over these 3 years of hosting. We have datacenters in Dallas, Seattle, Washington and have just launched our datacenter in India, New Delhi. We have more than 1000 clients worldwide and are still adding more each day. Our motto is YOUR SATISFACTION. We are the cheapest in the industry and specialize in Business Class Hosting (Shared Hosting as well as VPS). Our expert support team is constantly striving to provide you features that would best suit your needs. Just feel free to ask any questions from our support team through our Live chat and we would be happy to guide you. We do not try to sell what we want rather what you wish you buy from us. Just visit Web Host BD for further details about our company and the various plans we offer. We would be happy to have you with us.